On the second night of Austin Fashion Week the Warehouse 305 event space was filled with a packed house of Austin’s most fashionable including a celebrity sighting of Camila Alves and hubs Matthew with the family in tow. The Celebrate Texas night honored Style Setter JK Baxter Hunt, with a portion of proceeds benefiting The Arc of the Capital Area. That being said, the ARC of the Capital Area models, all who have different abilities; Fashion X, The Arc and Nordstrom came together to help highlight the fact that inclusiveness is critical – especially in the fashion industry. The show then continued with more than a dozen collections. As each ARC of the Capital Area model took to the runway, the crowd cheered in support for these special young men and women. But then everything changed when a young man named Andy blasted out onto the runway and decided he was going to own the runway AND the crowd. He held the entire venue captive with his entertaining dance number all the way down the runway with a standing and clapping audience. He truly captured our hearts. And this show was exactly what founder of AFW had in mind for this year’s runway event. “This. This is what I mean. This is everything. Redefine what it means to be a model. Redefine “beautiful.” Don’t let anyone tell you otherwise”, Matt said on a Facebook post from the video of Andy strutting down the runway. Here’s a quick recap from all the designers/participants from a night of great fashion in Austin, Texas. 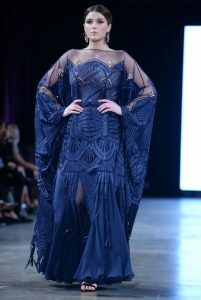 Celestino: This collection delivered dramatic pieces and detailed designs. A showstopping opening garment with a bird-like wingspan capt set the tone for the entire collection. Dramatic and elegant. L’Infinity by LeeAnne Locken: LeeAnne Locken of The Real Housewives of Dallas has created the ultimate little black dress, which can be worn 175 ways. Ferrah: Ferrah is an eco-luxury brand made by two friends from Dallas and Denmark (including Lela Christina Orr from the upcoming Season 17 of Project Runway). The entire collection was notably the most simply styled of the night. Their collection is also all sustainable. Brittany Nicole: This local Austin designer featured fun prints and gorgeous, hand-sewn butterflies on her clothing items. A local crowd favorite with her whimsy take on mixing prints. Austin School of Fashion Design: Nearly 40 young design students featured their own creations. The Austin fashion scene is in good hands with this talented group! And this year we celebrated ASFD breakout designer Sadie Swinney. League of Rebels: League of Rebels delivered two collections for the crowd. All tailored pieces for which they are known. SuKaz Jackets: This brand is all about one-of-a-kind wearable art pieces. The designer is inspired by her travels to Kazakhstan. Sadie Swinney: Sadie, the daughter of Fashion X’s /Austin Fashion Week Matt Swinney, debuted her first three-piece collection. 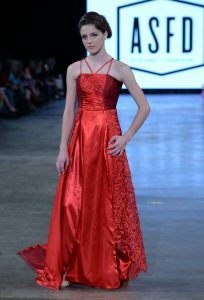 A great first showing for this young and talented designer and have been told the next collection is already in the works. House of Pins: Unique materials and neat surprises were seen in this collection from House of Pins. Verlon Ilene: Here, we saw custom pieces like a flowing white wedding gown. Phit Clothing: Phit Clothing is a size-inclusive activewear brand for men. I.Y.O. Swimwear: This Austin-based brand creates custom-made swimsuits. megMORGAN: megMORGAN’s designs are all about Southern style. Bess & George: Bess & George gave us flattering basics for a busy Austin woman on the go. Malen Reyes Couture: High fashion was seen from this mother and daughter duo.